I spent this week's "day of rest" testing new (and yummy) Sweet Dog treat recipes. The KitchenAid mixer sounds like a "call to arms" to the three labs that live in my house. The dogs are not subtle, they get in the way, hoping to pry loose a scrap of cookie dough. This particular Sunday, Reggie (my Sweet yellow lab) chewed a big hole in my oven mitt ... so finished I the day taking hot cookie sheets out of the oven with a beach towel. 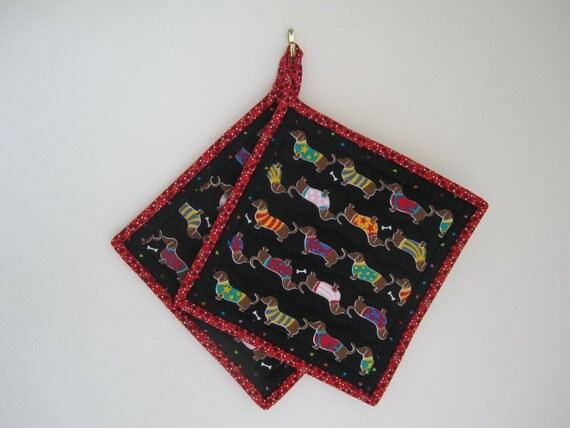 In search of new potholders, I came across this cute dog themed potholder made by Ilse at the Etsy store, ISewTotes . They are perfect for all the Dachshund fans out there. I also like the "We Have Got You Covered" apron-pot holder combo offered Beekman 1802 Mercantile. The hemline pockets are designed to protect your hands from hot or frozen dishes. Both look like they can stand up to waiting dog mouths.